71 pages. 47 color reproductions. Clothbound. This book represents the first body of color works by the artist Laurie Simmons. The Interiors and Bog Figures are a group of two series of photographs that consist of constructed interiors and manipulated exteriors. Within these constructed spaces, Simmons explores the boundaries of reality and fantasy, and of nostalgic memories and idealisms. There are no greater iconic images to depict a post World War II, 1950's. suburbia than housewives and cowboys. In a time when television became the most influential form of mass media, female and male identities were formulated through commercials, advertisements, and movies. In a 1992 interview with Sarah Charlesworth, Simmons stated that she was not, "trying to make a statement about women's lives, but trying to recreate a feeling, a mood from the time that I was growing up: a sense of the fifties that I knew was both beautiful and lethal at the same time." 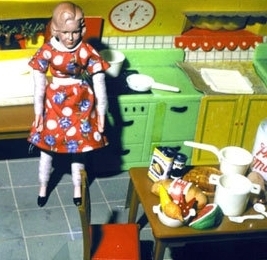 While the plastic dolls provide the viewer with a sense of play, the reality of the images is unavoidable. The female is pictured in the home, but she is alone, isolated and vulnerable. The cowboy, however, exudes the confidence and independence of a life of adventure, yet the cowboy cannot escape the implied violence, racism and paternalism that also characterize the ideal. This book contains a new essay by Collier Schorr.